Starting a natural hair journey can be exciting and kinda frightening all at the same time. There’s lots of new information and we’re ready to soak and take it all in, after all, we’re practically learning a new language, and we wanna learn it fast. With our foot already settled in the Spring and with Summer coming next, it’s a good time to talk about sun protection that can rescue your curly hair this Summer. For most new and seasoned curly girls the most popular places people look for info and guidance are Google, YouTube, other curly girls and online and paper magazines. As I’ve said so many times in the past, you can find great information there, but most of the time you should be very wary of it. I find hairstyles tutorials, the sharing of hair journey experiences, big chops and similar content can be informative or even educational. However, most of the time you have to question statements and even do a little bit of research to make sure the info is legit or based on facts, you know?! However, most people don’t go to all this trouble, they trust what is given to them since the info is ‘obviously’ coming from someone who has been through what they haven’t yet. Unfortunately, this isn’t always the case and the info can often be misleading, incomplete or just plain wrong. Luckily, I like digging these things up for you. 😀 This is what I recently did after coming across an article from Essense that promised a professional’s insider tip to protect our hair for Summer. 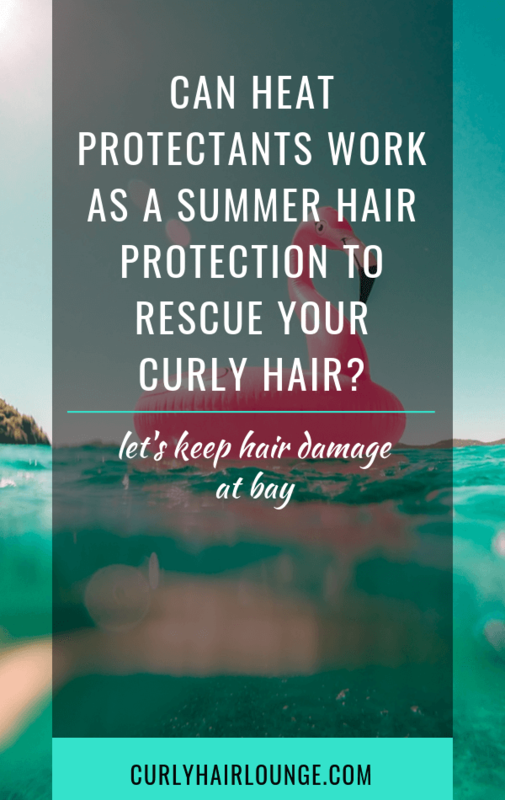 If you’re like me, you’re all about learning about Summer hair protection especially one coming from a curly hair professional and in this case a celebrity stylist. So, according to Ursula Stephens, the hairstylist, the tip that will change you hair-game this Summer is to use a heat protectant on your hair to protect it from the high temperatures. The article suggested a Tresemmé heat protectant, but apparently, anyone will do. So far, so good, right?! When clicking to read the article I thought it would be greeted with a few hair product suggestions with SPF, but I gotta say I was surprised by this. I never thought of it and you probably didn’t as well. It got my neurons firing and I went to search for evidence. However, when it comes to Summer hair damage the real damage comes from UV rays. They have a bleaching effect causing the degradation of the melanin in the hair, or in other words, UV rays cause our hair colour to fade and lose its shine (not good news for us curlies when we already have so little of it). UV rays also weaken the protein bonds in our hair making it vulnerable to manipulation, use of hair tools and it can also trigger other issues such as split ends, increased porosity, breakage or dehydration. For more on this subject, you can read Sun Damage To Curly Hair. Therefore, it’s clear to assume that for a heat protectant to be a Summer hair saviour it would need to offer both heat and sun protection. So, now I guess you’re thinking. 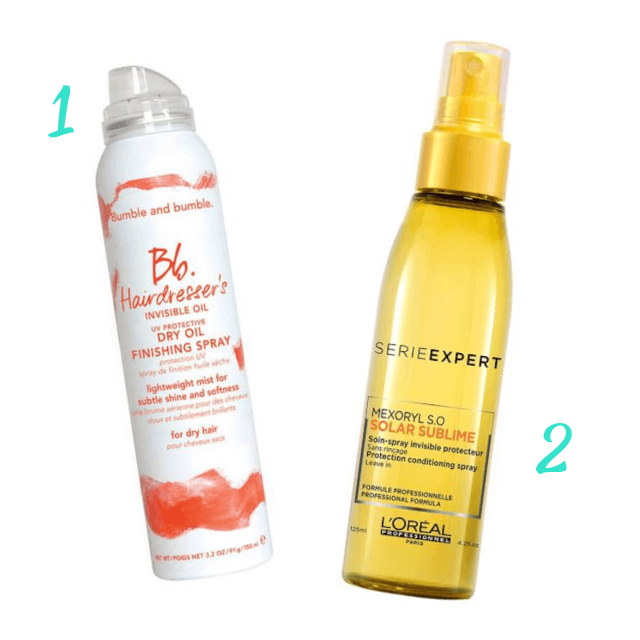 Do heat protectants offer SPF for curly hair? I’m one step ahead of you, kiddo! Virtually ALL heat protectants are made out of a combination of common insoluble silicones like dimethicone, Cyclomethicone and Cyclopentasiloxane. As you probably know and according, to extensive research done on them, silicones are film-forming ingredients. They add viscosity and spreadability to a product, shine and smoothness to hair and skin, protect hair from heat styling tools and can be used in a manner of different ways. (For more about Natural Sun Protection For Your Curly Hair you can read this post I wrote a while ago). Still, even though these are all good qualities, silicones are not known to have SPF. Well, it was for me. According, to the paper, just 4% of this silicone blended into “a suncare formulation containing organic sunscreens can increase the SPF from 5.7 to 18”. This actually ends up saving money to companies as they can use less of the sunscreen ingredients and see their product have a boost its SPF. To summarise, what this all means is that a heat protectant will protect your hair against high temperatures (from hair tools and climate), but for it to protect your hair against the sun it would need to have a combination of silicones and/or dimethicone crosspolymers (heat protectants) and organic or chemical sunscreens – and I had a hard time finding such product. Silicone alone, which is a heat protective ingredient that most heat protectants are made of, won’t offer sun protection. Just so you know here are a few ingredients you can find in your hair products that are used to absorb, block or scatter UV rays that you can find in your hair products: Benzyl Salicylate, Benzophenone-2, -4, -6 and -8, Ethylhexyl Methoxycinnamate, Butyl Methoxydibenzoylmethane, Octocrylene, Ethylhexyl Salicylate, Octyl Salicylate. I did find hair products with dual functions (e.g. styling gel and heat protectant) that had such characteristics using patented formulas, but since the celebrity hairstylist that prompted this post mentioned only heat protectants, I focused this post on them alone. Mielle Organics Mongongo Oil Thermal & Heat Protectant Spray 2. Briogeo Farewell Frizz Blow Dry Perfection & Heat Protectant Crème. Bumble and Bumble Hairdresser’s Invisible Oil UV Protective Dry Oil Finishing Spray 2. L’Oreal Serie Expert Mexoryl Solar Sublime. What precaution do you take to protect your natural during Spring and Summer? Featured image: Photo by Vicko Mozara on Unsplash.